What am I searching when I use the articles scope? What does Multiple Sources Exist mean? 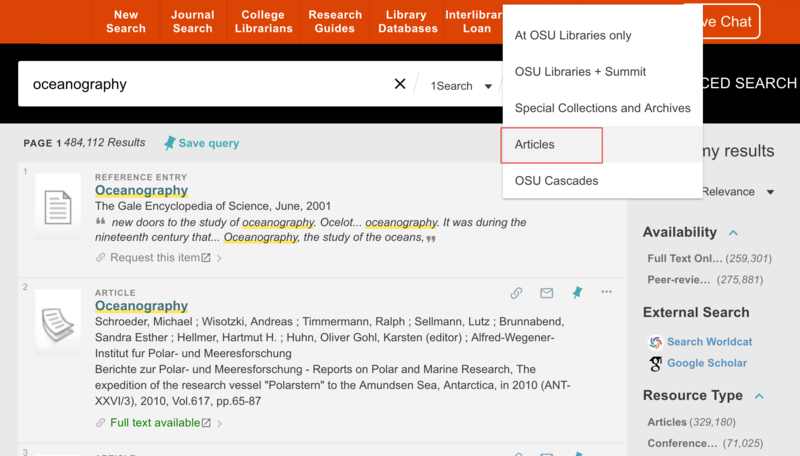 After you enter a search in 1Search on the OSU Libraries' homepage, you will be asked to sign in. We are encouraging you to sign in before you see your search results so you can get the full benefit of 1Search. You can save searches and items to your favorites. They'll still be there when you sign in the next time. If you go in as Guest, you can put things in your favorites but only temporarily. Once you exit 1Search, they will be gone. There is some content from online journals and ebooks that will not display unless you are signed in. The publishers/vendors make this a requirement. If you want to search the breadth of our online content, you will want to sign in. You can always log in later in the top right corner of the screen but you'll want to rerun your search to get the maximum benefit. When you choose the Articles scope, you are searching across many but not all of our online databases. The default is to retrieve those journal articles that are available full text as well that those citations to articles to which we do not have full text online access but we can get for you from another library via Interlibrary Loan. The article content for 1Search comes from a variety of sources such as publishers or databases. Sometimes the same article will be listed in multiple sources and you will see duplicate records in 1Search. These may be listed individually or grouped under the Multiple Sources Exist. There is no difference in the version other than the original source (publisher or database).